What have you done to me, Mum? I am beautiful cat goddess, and you turn me into this freaky clown? Why? As you can see, Mummy dear has been playing around with Photoshop again. How she could ever think this is art is beyond me. She's obviously been on the wine again. I may be a kitty, but I can still use my paws to type and play around with a few keys so here is my revenge! Now that wasn't nice to do to your Mum Athena. I actually like that effect on you, your Mum's isn't bad either except her eyes look a little scary. Athena, your mum's not on the wine, you look great! ha, double the fun. The green face reminds me of Wicked on Broadway. 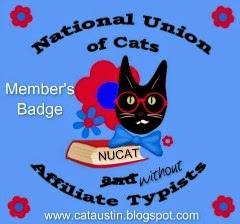 We're just putting together our Caturday post and will join in this week. Fair is fair... but actually I like both! We think your furs look very cool like that Athena, love the art! We don't blame you for getting back at the Mum though...Have a great Caturday! Your link is closed, we'll try back later to post our pic. As Clooney said...your link is closed, and we cannot enter our photo. Expect it will be open by the time we get up in the a.m.
You are not a freaky clown you are an Andy Warhol artwork ! He only did it with Marilyn Monroe ! There is a problem with inlinkz ; I get "You need to be logged it to access the code." The two other links don't work either ! Sorry about the link problem. I made an error with the closing time, and as I'm on UK time I've only just got up and wasn't able to fix it earlier. 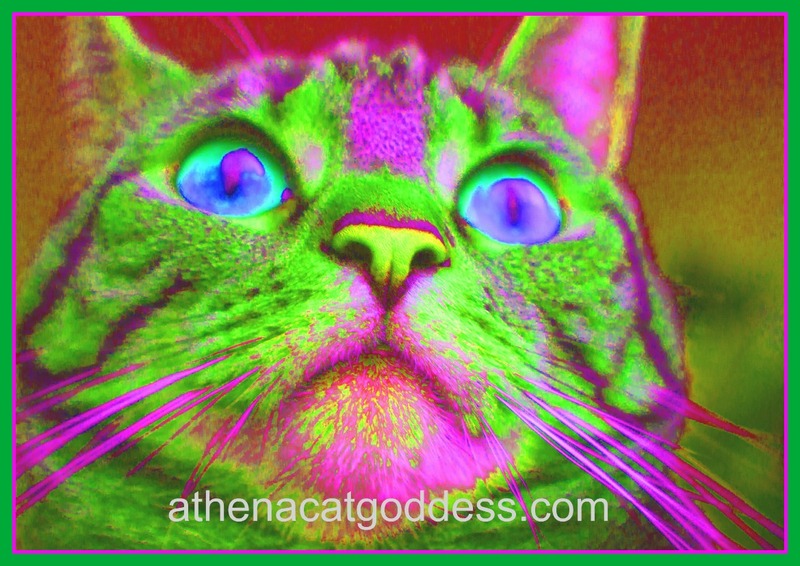 Athena you look very cool and colorful and oh so pretty. OMC! What a scary zombie clown! I’m glad you got some revenge. Weird! But in a cool way! Wes LOVES those photos! It's different but we kind of like it! Those are wake you up kinda colors! Woooo wee cool! I think you're beautiful no matter what colors are used, Athena :) It's great that you got your mum back though! Fun Colors! Mom changed my ears to aqua and green, but not as bright as yours! We am purrticipating but we dont have an inlinks account... so mom just put the logo on the post and linked back here.... Lil Bear. oh we tried the last link and we could sign up without having an account!!! Hooray! Happy Caturday.... Katie Kat. I love these colors and this was the perfect photo for it! Sorry about that. I don't know why they've changed it. The thing is I'm paying to use their service until August so can't stop using it until then. It's so annoying I know.